It seems almost inevitable that marijuana will become legal in more places in the United States. President Obama has promised not to enforce the federal law for small quantities and making it legal can make it taxable. That might even help the states with their budgetary problems. So, it just is a question of time. It is also time to look carefully at what that will mean for our society and our children. A recent report from the National Institutes of Health notes that cannabis use is on the rise in high school students.1 This is particularly significant in light of the fact that the use of other drugs, including tobacco, is falling. In other words, it seems that teenagers are being more careful not to use harmful substances, except for marijuana. The reason is that most teens do not consider marijuana harmful! First, in contrast to other drugs (including medications), it is almost impossible to overdose and die from marijuana. It is quite easy to use almost any other psychoactive substance to commit suicide. Deaths from overdoses of narcotics, cocaine and its related substances, amphetamines etc., are all too common. If it can’t kill you, how bad can it be? Even alcohol, which is legal, is worse than marijuana. Drinking and drunkenness cause much more deaths and disabilities than marijuana will ever cause. Second, there are more and more medicinal uses for marijuana. Hundreds, or maybe thousands, of cancer patients are saved by medical marijuana. Glaucoma sufferers swear by it. There are many people that claim that it helps with cluster headaches and a number of other debilitating maladies. These two arguments are inherently flawed. They obscure and hide the truth. 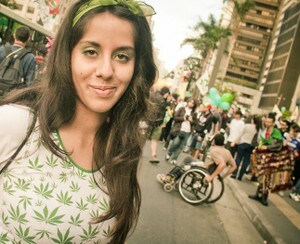 They are promoted by people who are not unbiased, but by people who want to have freer access to marijuana. The first is flawed because just because something doesn’t kill you, it does not mean that it won’t harm you. Migraines don’t kill anybody, but it causes pain, suffering and damage to the brain. We need to examine what are the potential damages even if marijuana won’t cause the ultimate damage! But before we do that, let’s look at the second argument: Marijuana has medicinal uses, therefore it cannot be harmful. Why is that flawed? That’s simple. Just because marijuana has medicinal use doesn’t make it healthy. Narcotics have important medicinal uses. I don’t know anybody who would want to undergo a surgery without painkillers. In fact, every medicine has negative side effects. I cannot think of any medicine that is good to take when it is not really needed. The fact that it can be used as medicine should actually be an argument that it is not healthy! In the current issue of the Proceedings of the National Academy of Sciences there is in article that discusses the long term effects of marijuana use for people who begin in adolescence.2 These scientists looked at over a thousand people and followed them from age 13 to age 38. They tested their cognitive functioning (their thinking power) at age 13, and then again at ages 18, 21, 26, 32, and 38. Even when they took into account such factors like education level and cigarettes smoking the people who used cannabis for 20 years, starting in the teenage years, had lower IQ’s than their peers who didn’t use the drug. But teenagers are notoriously bad at heeding warnings about dangers lurking in the future. If it doesn’t effect them now, in their eyes, it probably will never happen to them. So, the question is: does the marijuana use effect their current functioning? The students were between 9-12 grades and their academic achievement and their classroom participation were evaluated. Regardless of whether or not they smoked in school or out of school they scored lower on all measures of achievement and motivation. These lower scores were also true regardless of race or gender. All students who used marijuana could be expected to do worse in school than if they did not use marijuana. This seems to be due to difficulties in paying attention and slower processing of information that the students are trying to learn. I have had students in my college classes who claim that they learn better in class if they smoked marijuana before class. I tend to believe them. Not because I think that the drug helps them learn better but because by the time they are coming to college classes they have been using the drug for long enough to build a type of dependence of it. Not necessarily the type that causes the withdrawal symptoms one gets from other substances, but a dependence on having the chemical in the brain to feel normal. In other words, smoking pot doesn’t bring them up above average, rather going straight (at least for that day) brings them down below their baseline. Teens Risk Permanent Cognitive Damage! Here’s the real clincher: If the adult who began using weed as a teen stops he or she does not regain what is lost. Going straight does not straighten out the brain. The damage seems to be permanent. At least for those kids who began early. This is serious stuff. So it won’t kill you. But if it is harder to pay attention, you take longer to learn new knowledge and skills, and your focus is not up to par, then you will earn less and enjoy life less. The nature of adolescence is that most of them will either not understand these dangers, and if they do they will probably think that it doesn’t apply to them. So if politician and provocateurs pledge to make recreational marijuana legal, concerned and thinking adults and parents need to make sure that strong safeguards are set up to keep it out of the hands of the young people. Advertising and education has to be put in place to inform the youth of the risks, just like the warnings that are in place for the other legal drugs, tobacco and alcohol. Meier, Madeline H."Persistent cannabis users show neuropsychological decline from childhood to midlife. "Proceedings of the National Academy of Sciences of the United States of America 109.40 (2012): 15980-64. Finn, K. V. (2012). Marijuana Use at School and Achievement-Linked Behaviors. High School Journal, 95(3), 3-13.